Toys have the capacity to flood our brain with memories long after they are playthings of our youth. We all have memories of playing with toy cars, dolls, puzzles, games, and coloring books. They mark a time and place both personal and communal. World of Speed’s toy collection is just that, intertwining our collective memories of motorsports from our youth, while being preserved and celebrated as part of the World of Speed Archive Collection. On hands and knees, a 1930s kid rolls a toy car version of Campbell’s 1930s land speed marvel Blue Bird over a living room floor. Thirty year later, daredevil racer Kitty O’Neal, in doll form, is launched over the couch into an exciting racing adventure by an imaginative youth. Jump forward twenty years and kids are putting on toy helmets with the sounds of the racetrack in their ears. By the 1990s, Hot Wheels were a staple in many homes, spread out over living rooms and bedroom floors by hundreds of thousands young racing fans. 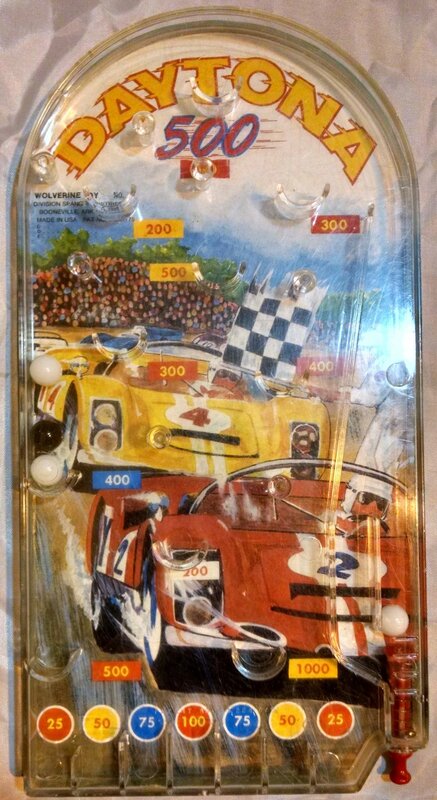 …while Scalextric was one of the earliest hand-booster track toys of the 1960s, and still around today. …and our smallest item in the collection, a silver Monopoly Harley-Davidson land speed cruiser token no more than half inch in length. And don’t forget to stop by the Archive Room for coloring sheets from the 1970s “Superstars of Drag Racing” coloring book. If you have motorsport-related toys, dolls or games you would like to donate, contact katrina@worldofspeed.org.